By the time the Oakland Raiders faced the Houston Oilers in their season finale on December 22, 1963, they had long ago become the talk of the American Football League. In the first three years of the AFL’s existence, the Raiders had been one of its poorest clubs – both on and off the field. They had gone a combined 9-33, including a dreadful 1-13 in ’62, under three head coaches. That all changed in 1963 as 34-year-old Al Davis, previously an assistant under Sid Gillman with the Chargers, took over as head coach and general manager. The team had a new look, in silver-and-black uniforms, and a new attitude summed up in the phrase “pride and poise”. Their record coming into the contest with Houston was 9-4, having won seven straight after a 2-4 start, and the Raiders were just a game behind division-leading San Diego. The Oilers, under Head Coach Frank “Pop” Ivy, were going in the opposite direction. They had finished on top of the Eastern Division in each of the first three AFL seasons, and were overall champions after the first two. However, following six wins in the first ten games, Houston had lost three straight to fall out of contention at 6-7. With 36-year-old QB George Blanda (pictured at right) and an able group of receivers, the Oilers were still capable of putting points on the board – as they would prove against the Raiders. There were 17,401 in attendance at Frank Youell Field, the temporary structure built by the city of Oakland while a new facility was awaiting construction. The crowd may have been small, but it was enthusiastic and on its feet for much of the game. Still, the Raiders offense started slowly, not getting a first down during the first quarter, although they got a quick score when CB Claude “Hoot” Gibson returned a punt 68 yards for a touchdown. The Oilers came back with a four-yard scoring pass from Blanda to flanker Charley Hennigan that capped an 11-play series. Before the first quarter was over, Blanda’s passing set up another touchdown as he tossed a swing pass to FB Dave Smith for a 32-yard gain – Smith then followed up with a two-yard touchdown run. Houston seemed to be getting the breaks as a Flores pass was deflected by LB Doug Cline and intercepted by FS Fred Glick, who returned it 14 yards to the Oakland 27. An unnecessary roughness penalty moved the ball to the 12 and Houston’s lead was 21-7 after Blanda immediately threw to end Willard Dewveall for a TD. The Raiders fought back as Flores hit on three passes, to split end Art Powell (pictured at top) and flanker Bo Roberson, and connected with TE Ken Herock for a seven-yard touchdown that capped a six-play, 49-yard drive. A few minutes later, the score was tied when Flores took advantage of Powell and Roberson splitting the defenders to opposite sides and threw to star HB Clem Daniels, an outstanding receiver out of the backfield as well as runner from scrimmage, straight down the middle for a 56-yard touchdown. The second quarter scoring was far from over and it was Houston again with Smith catching a pass from Blanda at the 10 and pulling away from LB Jackie Simpson for 25 yards and a TD. The possession had lasted for six plays and covered 64 yards. The Raiders again tied the game at 28-28 as Flores, having been sacked for a nine-yard loss but seeing that the Oilers were continuing to go with single-coverage on Powell, connected with the star split end for an 81-yard touchdown - the ball traveling some 60 yards in the air. Houston came right back in four plays, with Blanda throwing to Dewveall for 35 yards to the Oakland nine and was helped along by a pass interference penalty in the end zone. FB Charlie Tolar crashed over from the one to put the Oilers back in front at 35-28. Getting the ball back with just over a minute left in the half, the Raiders scored in six plays, four of them Flores passes, the last of which was to Powell in the corner of the end zone for a 20-yard TD. Mercer tied the game once again with the extra point. The tally was 35-35 at the half, with the teams having combined for 49 points in the second quarter alone and 21 inside the last two minutes. Each quarterback had completed 12 passes - Flores already had accumulated 277 yards and Blanda 222. On the first play from scrimmage of the third quarter, Daniels ran for 11 yards, fumbled, and recovered when a Houston defender inadvertently kicked the ball back to him. Still, the Raiders, who had scored on their last four possessions, finally had to punt. Oakland got the ball back and advanced into Houston territory - it appeared that Daniels had run 62 yards for a TD but an official ruled that he had stepped out of bounds at the 35, cutting the gain to 27 yards. After the Raiders were pushed back by a holding penalty, Powell scored again, splitting two defenders and pulling in a Flores pass for a 46-yard TD. It gave Oakland the lead for the first time. Down 42-35, the Oilers came back, taking four plays to get to the Oakland 26 from where Blanda fired to Dewveall, who made a tumbling catch for a touchdown to finish off the 69-yard drive. The score was tied at 42-42 with just over seven minutes remaining in the third quarter. The Raiders had to punt and Houston scored again on a Blanda pass play to TE Bob McLeod, who outmaneuvered CB Fred “the Hammer” Williamson, that covered 21 yards for a TD with 2:22 to go in the period. The Oilers had gone 67 yards in seven plays. At this point, the teams exchanged interceptions. On the first play of the fourth quarter, Flores was picked off in the Houston end zone by CB Bobby Jancik. 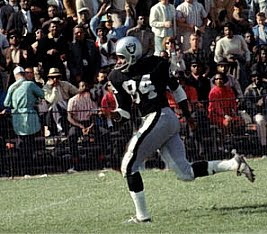 A pass thrown under pressure by Blanda was then intercepted by LB Archie Matsos to give the Raiders the ball at the Houston 24. Flores went to Powell for a 23-yard touchdown, with the receiver pulling in the ball at the ten, stumbling, and then leading three defenders into the end zone. Once again the score was tied at 49-49 and there were still nearly twelve minutes to play. Houston again drove into scoring position but Gibson intercepted Blanda’s pass on the goal line. The Raiders proceeded to drive from their 20 to the Houston 32. Mike Mercer, attempting the only field goal of the game by either team, was successful from 39 yards with 4:37 remaining on the clock. There was still plenty of time, but the Oakland defense rose to the occasion. DE Jon Jelacic hit Blanda and forced a fumble, which the Oilers recovered. Rushed hard again, Blanda’s poorly-thrown pass was incomplete intended for Dewveall. DE Dan Birdwell knocked down another pass that was intended for McLeod and Houston was forced to punt. Taking over on their own four, the Raiders successfully maintained possession to run out the clock, giving the ball to Daniels (pictured at left) six times in eight plays. On the final play of the game, and with the home crowd chanting his name, Daniels ran for three yards to break the AFL season rushing record. Oakland won the offensive scoring fest by a final score of 52-49. The 101 points broke the previous record of 93 by the Chargers and Titans in 1960 and would remain the highest-scoring game in the AFL’s 10-year history. Records were also set for combined passing yards (749), combined TD passes (11), total yards (1063), and combined TDs (14). The Raiders gained the most yards (540 to 468) while Houston led in first downs (27 to 21). Each team turned the ball over two times, but the Oilers sacked Tom Flores seven times and the Raiders were penalized on 9 occasions, for a loss of 88 yards, as opposed to 6 flags thrown on Houston. Art Powell had an especially noteworthy performance as he caught 10 passes for a club-record 247 yards and four touchdowns. Tom Flores threw for 407 yards and 6 touchdowns as he completed 17 of 29 passes and had two intercepted. Clem Daniels rushed for 158 yards on 22 carries and gained 76 more yards on his two pass receptions that included the one long TD. 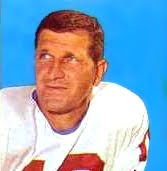 For the Oilers, George Blanda was successful on 20 of 32 throws for 342 yards with 5 touchdowns and two picked off. Willard Dewveall hauled in 7 of those passes for 137 yards and two scores. Dave Smith gained 94 yards out of the backfield on 4 catches that included a touchdown and also ran for 43 yards on 8 carries and a TD. Charlie Tolar was the team’s leading rusher as he gained 65 yards on 12 attempts and scored once. It was the eighth straight win to close out the year for the resurgent Raiders, but San Diego walloped Denver to clinch the Western Division title. Still, the 10-4 tally marked a huge turnaround for the franchise as well as a second place finish. Houston came in third in the Eastern Division at 6-8. “I’m not crying,” said Al Davis. “We’ve had a fantastic year. The only problem was, no one else could knock off the Chargers, so they’re the champs. But these guys are my champs. They’ve given more than a football team should be asked to give, and they deserve every bit of praise and honor that comes their way.” It was the beginning of what would be a long association between Davis and the Raiders – although he was head coach for only the first three years of that association. 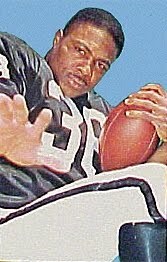 Art Powell, in his first year with the Raiders following three with the New York Titans, led the league with 1304 receiving yards and 16 touchdowns on his second-ranked 73 catches. He averaged 17.9 yards per reception, was a consensus first-team all-league selection and chosen for the AFL All-Star Game. In addition to accumulating his record 1099 rushing yards on 215 carries, Clem Daniels also led the league in yards per reception (22.8) as he gained 685 yards on 30 catches. He, too, was a consensus first-team All-AFL choice and was named to the league All-Star Game. He also received MVP honors from The Sporting News. Tom Flores (pictured at right) led the league in yards per completion (18.6) and percentage of TD passes (8.1) as he threw for 2101 yards with 20 touchdown passes and 13 interceptions. It was a great comeback for a player who had missed all of the 1962 season due to a bout with tuberculosis.